Downtown vacancy rates in San Francisco declined in 2011 and are now at 11% for office and 6.7% for retail as average downtown office rents have increased 16% to $39.25 per square foot. Roughly 13% (1.8 million square feet) of proposed commercial space in San Francisco’s entitlement pipeline is located Downtown. Downtown San Francisco had a net loss of 31 residential units from demolition in 2011 versus a net gain of 269 units citywide. However, 9% of the proposed residential projects in the entitlement pipeline, or roughly 3,900 units, are located Downtown. 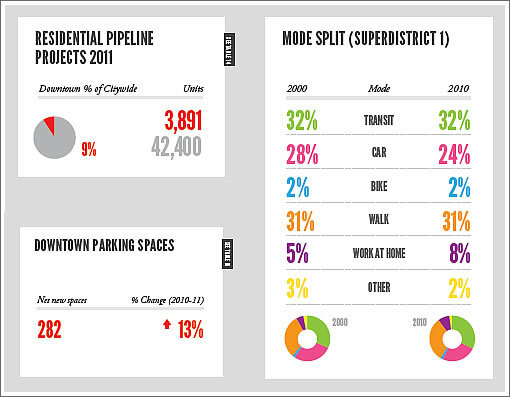 While overall employment in San Francisco increased 1% citywide in 2011, it increased 14% to 233,500 jobs Downtown. And the method by which employed residents in the northeast quadrant of San Francisco commute to work has changed relatively little from 2000 to 2010 with the 2010 split being 32% transit, 31% walk, 24% car, 2% bike, 8% work at home, and 2% other. In terms of parking, there are roughly 33,400 off-street parking spaces Downtown (about 20% of the 166,520 spaces citywide) and the City’s plan to limit the number of long-term parking spaces to the number that existed in 1984 has generally been achieved by restricting the supply of off-street parking spaces in new developments. surprising to see the use of bikes hasn’t increase in the past 10 yrs. The only impact on cars has been the new option of working from home. @ spencer…right about the flat growth of bikes. Based on what the SF Bike Coalition has been putting out I was thinking that 8% of people rode their bikes to work! In recent years, the city has encouraged riding by leaving welcome mats in the form of bike lanes, including on part of Market Street. Longtime riders like Cullen have plenty of new company – recent surveys by the Municipal Transportation Authority show a 71 percent ridership increase in the past five years. In theory, these two numbers aren’t necessarily in conflict…but it’ll be interesting to see if the Planning Department’s Monitoring Report agrees with the increase reported by the MTA when it’s next released. I am also pretty surprised with the low numbers of bikes. Bikes in my office building are taking over room after room in the garage. I often get behind 15 slow kids at 8:50AM on Market (time I now avoid if possible for cycling). Then on the way back up, the turn to the Wiggle around Safeway’s feels like a freeway on-ramp. I would like to see these stats for the whole city, not just downtown. I would guess that bike ridership to work is way up in the Mission, Western Addition, Inner Sunset, etc. This is where more young people live. They bike and can’t afford to live downtown. My husband and I live downtown and we walk to our offices downtown. Biking to work is not appealing right now considering all the cars and buses. I wonder where the people work who are driving to work – maybe the East Bay or Pennisula. I can’t image anyone driving to work that lives downtown. I live near Folsom & 7th and bike to 18th & Florida. Perfect route for biking. I can’t believe any stats that say that biking is flat. It’s getting crowded out there! I do, many days a week, and it is awesome if you need to save time. I can get garage to garage (1.5 miles) in 5 minutes flat….and easily pick up/drop off my wife at caltrain on the way if need be. Biking such a short distance is a hassle (no secure bike parking and I need to dress “professionally”). I prefer to walk when I’m not doing the caltrain limo duty. I believe the 2% is of the total number of people who commute downtown, a lot of whom come from other cities. The percentage of SF residents who commute by bike would of course be higher. The ridership is up 7% over the last two years. There was a 30% increase in the counts, but they attributed most of it as a result of the fact that they shifted counting from summer to the school year. This MTA study shows overall ridership has more than doubled (109%) from 2006 to 2011. 75K cyclists each and every day. 31% walk to work. This is exactly why we need to build much, much more residential apartments/condos downtown, which are market-rate. Since the Bay Area is not building more BART or CalTrain lines, which are all stuffed with people similarly to the MUNI, the best way to deal with the increase in jobs is to build more housing near workplaces, so people can walk to work. I really wish SF would up-zone and add density anywhere within 10 blocks of BART and CalTrain stops. People can walk to work or walk to public transportation. I would gladly live downtown, if there was an affordable option. Right now, I either have to be practically a millionaire or a drug addict to get a place downtown. This could change if we greatly added units north and south of market st. Wish we would. So is anyone going to point out that the numbers from 2000 equal 101% and the 2010 numbers equal 99% ? Peter, the numbers not “adding” is due to rounding in each of the individual parts. The SFMTA and SF Planning department. Together at last… cooking up vanity data and throwing around catch phrases like Tom Cruise at a Scientology convention. Spare me your unquestioning, uncritical republishing of tripe. dashing to meetings, quick errands, and expanded lunch options, all door-to-door with no parking hastles. Here’s a bike commute tip for those who have to wear suits in the office: Lay out a long dry cleaning bag and carefully lay out and smooth your suit pants, layer another dry cleaner bag and lay out your suit jacket. Layer a third bag and carefully lay out your shirt/blouse. Roll it up lightly from the bottom, smoothing any wrinkles as you go, and pack it in your panniers or backpack. Voila! Works like a charm every time.